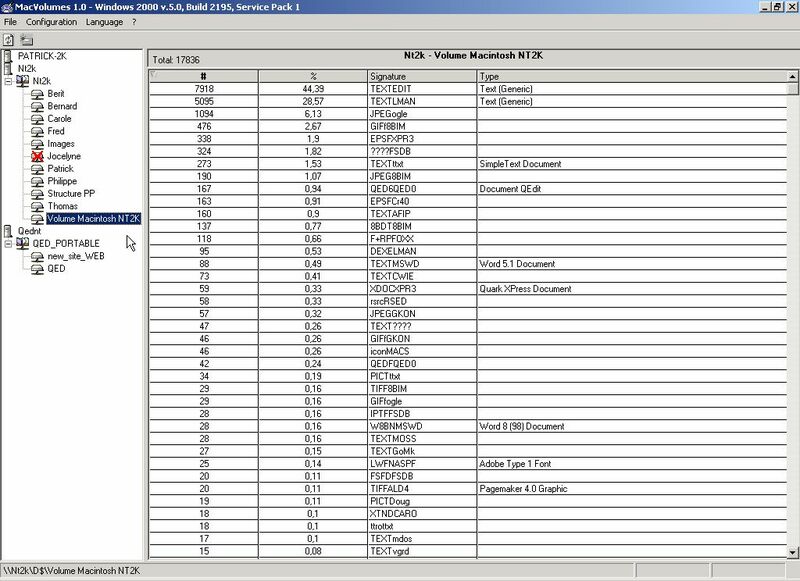 MacVolumes is a Windows utility to analyze Macintosh files signatures stored in Macintosh volumes index on Windows NT 4.0 or 2000 . The report status lets you detect a need of reorganization to maintain good performances. MacVolumes is free for personal use. Automatic connection to the Macintosh Servers and to Macintosh volumes; invalid volumes are also recognized (for example when the corresponding NT/2000 directories are renamed or removed). MacVolumes recognizes volumes which have been created by standard Microsoft Services for Macintosh (MacFile). It displays distribution and statistics about Macintosh files signatures (Type/Creator) as they are stored in Macintosh volumes index, i.e. in alternate stream AFP_IdIndex attached to each Mac volume. You can easily edit the correspondence table Signatures (Type/Creator) / Extensions. Runs on Windows NT 4.0 and Windows 2000. To help you on mass translation of IPTC texts characters in image files to tranfer between pc and pc we propose the CrossIPTC tool. MacNames : to rename automatically Macintosh files stored on a Windows NT or 2000 Server, removing illegal characters and adding filenames extensions; then Windows can identify the appropriate applications associated with renamed files. MacExplorer : a free explorer for Macintosh files stored on Windows servers. MacInfoTip : a free software working as an alternative Windows explorer to show Macintosh file specific components such as Type code, Creator code, Data fork size, Resource fork size and of Macintosh files Comments saved on any NTFS volume. Delenda : clean or transfer the contents of a list of folders on a workstation or on a server based on files dates (creation, modification, last access). Catalogue Files Metadata Miner : Windows cataloguer for documents data mining and file properties retrieval into XML/HTML/CSV/RDF file formats.